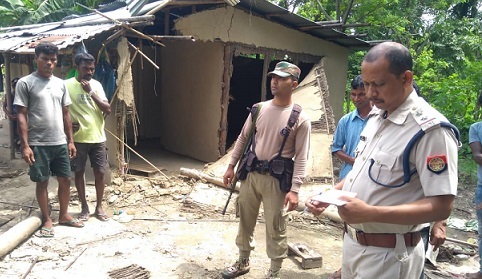 A huge wild elephant, which has been named as ‘Laden’ by locals, continues to create trouble for the villagers residing along the Indo-Bhutan border in greater Nagrijuli area under Baksa district for the last 15 days. The wild elephant has already killed two persons, Raghu Munda and Sambhu Boro, who hailed from Nagrijuli Tea Estate and Kumbhijhar village respectively on Monday and Tuesday last. As per information, on Tuesday night at about 11, the wild elephant entered No 6 labour line of Nagrijuli Tea Estate and created panic among the people. As soon as the people of the locality came to know about the arrival of ‘Laden’, they left their houses and took shelter in secured places. Some of people of the locality tried to scare away the wild jumbo by creating loud noise knocking bare pot, utensils and burning firecrackers but they failed in their attempt. 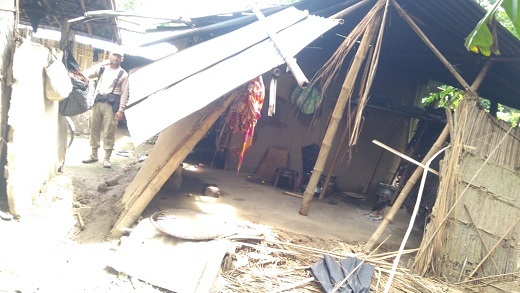 The wild elephant damaged houses owned by Amit Kumar, Birju Bauah, Armansai Ekka, Birsha Ornga, Bhimsai Tirkey and Richard Minj and ate all stored goods including rice. The wild elephant also damaged household goods like almirahs, beds, showcases and trunks in the area. It may be mentioned that students of the area have been largely affected by the atrocity of the wild elephant. After sunset all the villagers along with the students of various age leave their houses to safer places. Getting information about the entry of ‘Laden’, a team of forest officials led by Moti Ojha rushed to the spot and with the help of locals managed to scare away the wild elephant. A team of police led by Nikhil Singh, in-charge of Nagrijuli Police Out post also reached the spot on Wednesday morning and took stock of the situation at No 6 labour line of Nagrijuli Tea Estate. The range officer of Tamuulpur Forest Range, Keshab Brahma, told media persons that more persons involved with wildlife NGOs have been called to protect the villagers of Nagrijuli area and they would stay in the Nagrijuli forest camp to help the villagers. Brahma also said that high-power torch lights and high decibel firecrackers would be provided to the villagers to keep themselves safe from wild elephants. He urged the villagers to extend cooperation towards the forest officials in this regard.